The ongoing five-match ODI series between Sri Lanka and England has reached to its very end with the fifth and final match of the series scheduled to be played on Tuesday (Oct 23). Needless to say, rain has made its appearance in all the four ODI games so far in the series and as per the weather forecast, the situation is going to be no different when the two teams take the field on Tuesday for the final ODI of the series. As a cricket fan, we can only keep our fingers crossed and pray to the Almighty to allow us to witness a full game! The first ODI of the series was washed out due to rain and England won the remaining three rain curtailed games. The fifth and final ODI will be played at R Premadasa Stadium (RPS) in Colombo. 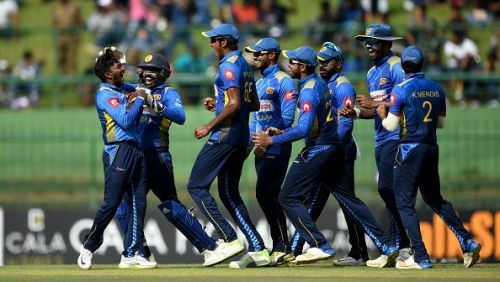 England have already won the series by a margin of 3-0 and that implies the home team Sri Lanka will be playing the final ODI to salvage some pride. Here are some of the statistical highlights of the ODI matches played at R Premadasa Stadium in Colombo, the venue of the fifth ODI between Sri Lanka and England. Starting from 1986 to till date, Sri Lankan team have played a good number of 107 ODI games at this venue. The home team have won 65 and lost 35 games. The other 7 games were abandoned. The Islanders have won two and lost three out of their recent five ODI games at this venue. Sri Lanka defeated the Netherlands by a margin of 206 runs long back in 2002. This is their biggest victory at this venue while batting first. And while batting second, Sri Lanka have registered two 10-wicket wins at this venue – against Bangladesh in 2004 and against England in 2011. Sri Lanka lost to India by a margin of 168 runs in August last year and lost to Pakistan by a margin of 9 wickets in 1994. These are biggest defeats for Sri Lanka while batting second and batting first respectively at this venue. England have played 11 ODIs at this venue in which they won just 2 games. Their victories at this venue have come against Zimbabwe (by 108 runs) in 2002 and against Sri Lanka (by 5 wickets) in 2007. However, considering the current form of the two teams, England are certain favourites to win the final ODI of the series.